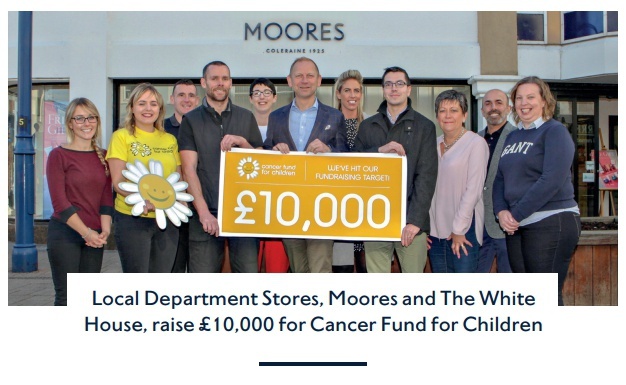 Children’s cancer charity Cancer Fund for Children’s partnership with local independent retailer Ulster Stores has reached its fundraising target of £10,000 – three months ahead of schedule. Thanks to the generosity of colleagues across the business and the local Causeway community they have raised this magnificent total. Ulster Stores chose Cancer Fund for Children as their charity partner of the year in February 2018. The amount has been raised through a variety of fundraising endeavours, with great effort from the teams in Coleraine at Ulster Stores’ Support Centre and Moores, alongside colleagues in Portrush at The White House.